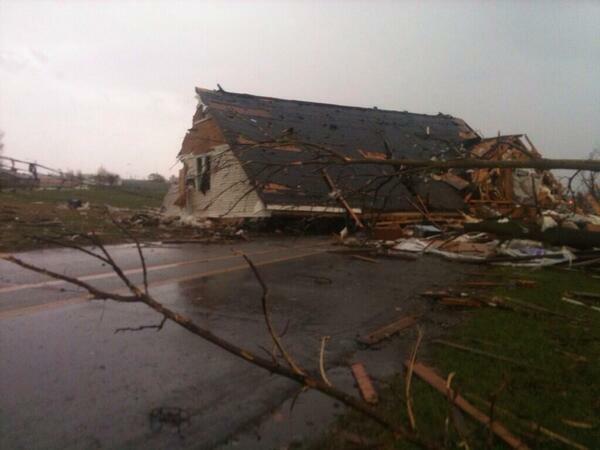 Six people were killed in Illinois and several more were injured as tornadoes raked the Midwest. 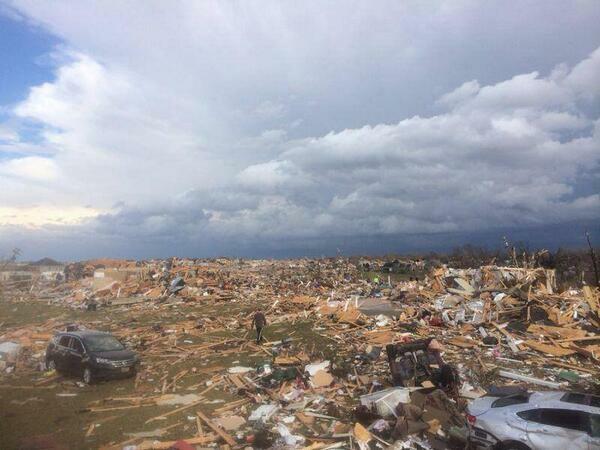 Besides Illinois, the severe weather also caused damage in Kentucky, Missouri, and Indiana. This post was updated on Monday at 1:30 a.m. ET to reflect the most recent events. At least six people are dead after a massive severe weather outbreak in the Midwest on Sunday that spawned several tornadoes across Illinois, Indiana, and portions of Missouri and Kentucky. Two people were killed in New Minden, Ill., a small town in the state's Washington County. Another person was killed in the city of Washington, Ill., in Tazewell County, Patti Thompson of the Illinois Emergency Management Agency told BuzzFeed. Two more people are dead and one is missing in Brookport, Ill., a town near the southern tip of the state, according to KFVS. Thompson was unable to confirm the information when asked by BuzzFeed, but Jonathon Monken, director of IEMA, confirmed the deaths to ABC News. Dozens more were reported injured in the storms near Washington, Pekin, Ill., and Peoria, Ill., according to the Peoria Journal Star. Tornado touchdowns have been confirmed by the National Weather Service in Vermilion, Champaign, Tazewell, Woodford, Peoria, Massac, and Iroquois counties. Damage has also been reported from severe weather in LaSalle, Wayne, Grundy, and Washington counties, according to IEMA. Damage surveyed in New Minden indicated the storm produced a powerful EF-4 tornado there with wind speeds of up to 200mph, according to the National Weather Service in St. Louis. Calls made by BuzzFeed to the office of Washington Chief of Police Don Volk were met with a message saying, "Due to telephone company facility trouble, your call could not be completed at this time," suggesting phone service outages in the city. Washington is home to over 10,000 people. As of Sunday evening, there were almost 80 reports of tornadoes, according to preliminary information from the Storm Prediction Center. 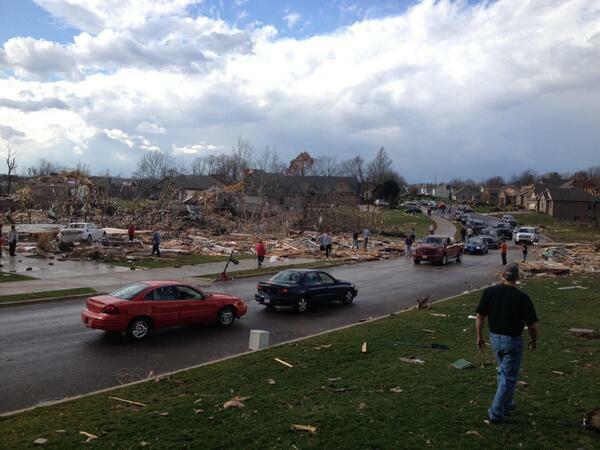 Most of these are in Illinois, but tornadoes also caused damage in Kentucky, Missouri, and Indiana. Major cities including Cincinnati, Cleveland, and Columbus in Ohio, as well as Louisville, Ky., are still at risk for dangerous weather Sunday night. 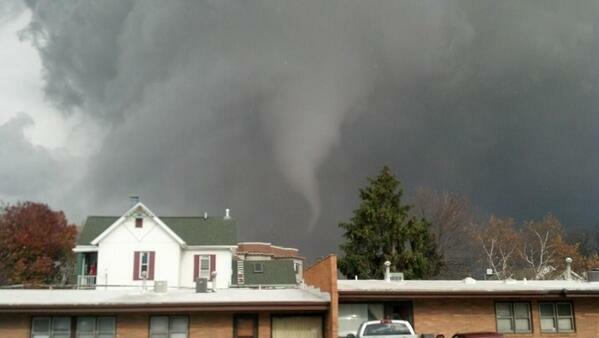 Tornadoes began touching down just after 11 a.m. CT, according to the National Weather Service in Chicago. More reports continued to come in past noon. 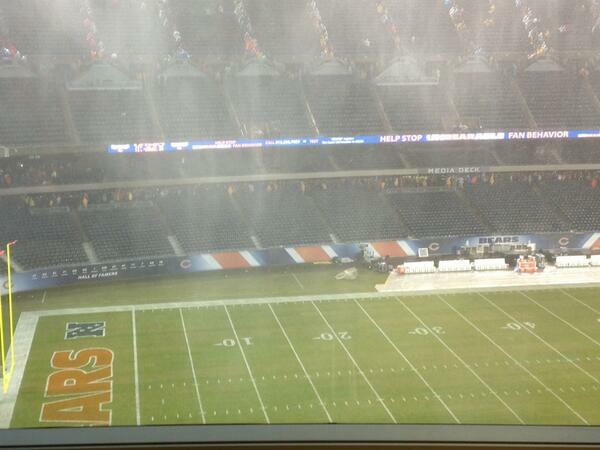 Around 12:30 p.m. CT, Chicago Bears fans were evacuated from Soldier Field in Chicago as debris began to fly around the stadium. And Illinois Gov. Pat Quinn urged everybody to stay inside. Today&rsquo;s severe weather warnings &amp; storms across #IL are very serious. I urge everyone to pay attention to weather alerts &amp; stay inside. Todayâ€™s severe weather warnings & storms across #IL are very serious. I urge everyone to pay attention to weather alerts & stay inside. 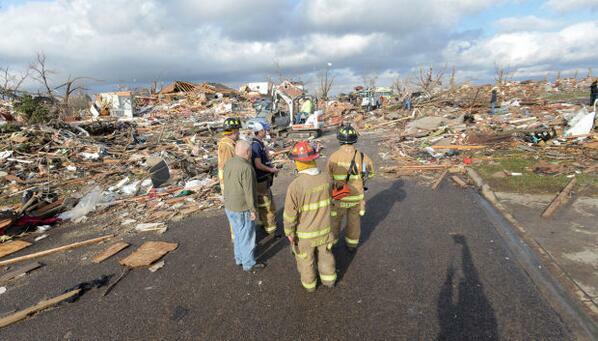 Photos and video from witnesses showed destruction in several small towns throughout central and northeastern Illinois. A tornado hit Pekin, Ill., around 11:30 a.m CT.
A tornado also slammed Washington, Ill. (population 10,000) — just east of Peoria. 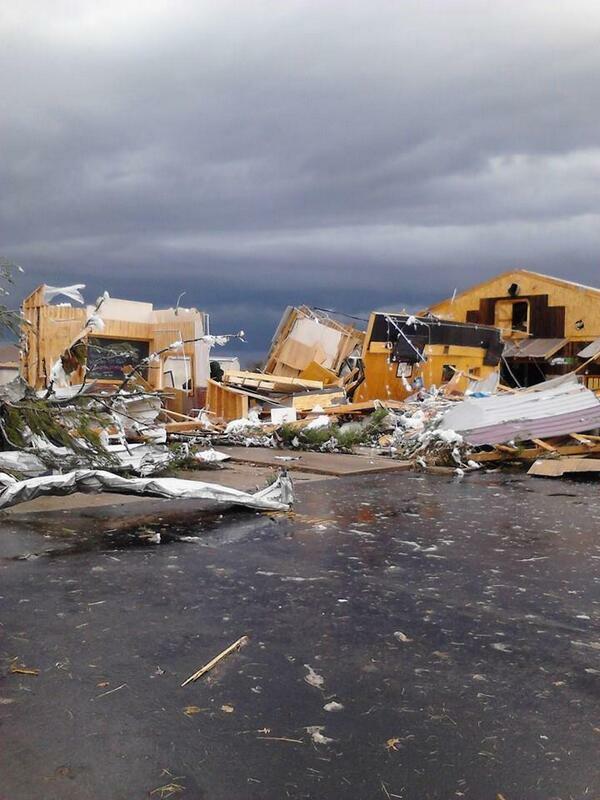 At least 50 homes were completely destroyed. 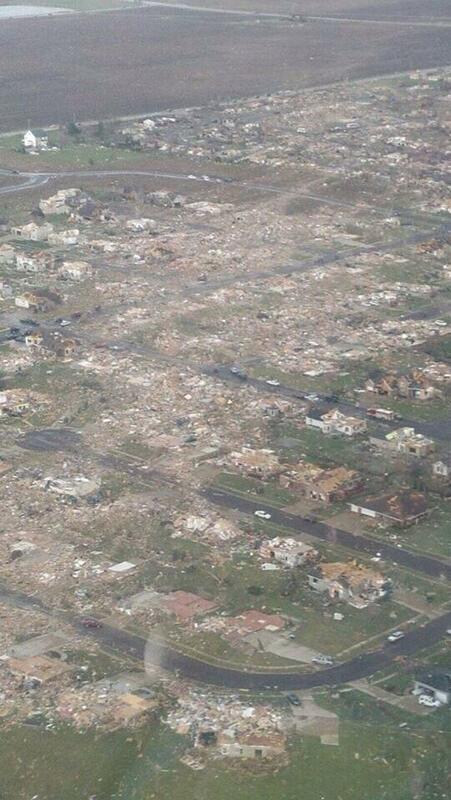 Devastation from Washington, IL. Please pray for those affected. Horrific images coming in. Just spoke with #Washington mayor. I asked what we can report to help. He said only "please pray." Footage of the tornado in Washington, Ill.
A man filmed the tornado pass behind his house in Washington. 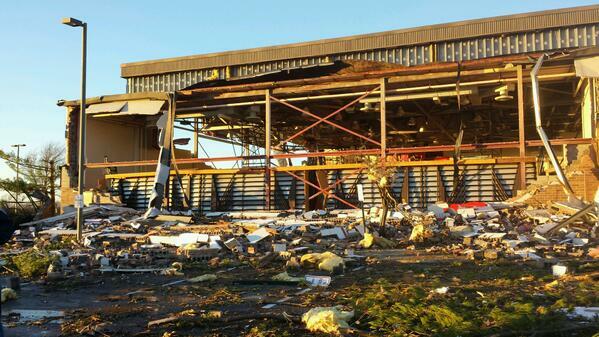 Coal City, Ill. — like Washington — was one of the towns hit hardest by the storms. The town is home to about 5,000 people. A tornado watch was also issued for central Indiana. Tony Merevick reports on national LGBT news for BuzzFeed. He has covered LGBT community news and politics since 2010 and joined BuzzFeed in 2013. Contact Tony Merevick at tony.merevick+DONE@buzzfeed.com. Contact Ali Vingiano at alison.vingiano@buzzfeed.com. Contact Rachel Zarrell at rachel.zarrell@buzzfeed.com.